1 PERSONAL TOUCH They’ll spend time getting to know your personal preferences so they can design a vacation that’s just right for you. 2 ADDED VALUE They’ll negotiate directly with resorts, tour companies, and cruise lines to get you deals you won’t find online. 3 PERKS From rooms with the best views to construction notices, upcoming events, and itinerary suggestions, travel agents have the knowledge, connections, and experience to book you in your preferred room category and resort. 4 CONVENIENCE A travel agent strives to get you the best value for your journey, which can mean exclusive packages, rooms in “sold-out” hotels, and special arrangements or requests. Agents can also help you navigate traveler’s insurance. 5 24/7 HELP A travel agent has the latest information at their fingertips. With years of experience and firsthand knowledge, travel agents save you countless hours and plan your trip with expertise no search engine can give. With GOGO on your side, we have you covered 24 hours a day, 7 days a week, 365 days a year. If you have an emergency within 24 hours of departure or while traveling, contact the Emergency Travel Center. Exclusive perks & special amenities at no additional cost with My Time, an elevated vacation experience. Traveling in a group of 10 or more? Take advantage of all the added perks, amenities, upgrades and more. About Our Star Ratings 22222 Exceptional properties offering the finest accommodations and amenities with an outstanding variety of premium facilities and services. 2222 Excellent properties offering well appointed accommodations and amenities with a superior variety of excellent facilities and services. 222 Comfortable and appealing properties offering dependable accommodations and amenities with a variety of facilities and services. 22 Moderately priced properties offering basic accommodations, amenities, facilities, and services. 2 Economically priced properties offering modest accommodations and limited amenities, facilities, and services. 1/2 star indicates that the property meets all criteria of the assigned rating and exceeds in certain areas. KEY HOTEL FEATURES Throughout this brochure, certain hotel profiles denote one or more key features of that property. Below is a detailed guide to these distinctions to help you choose your best vacation spot. My Time Unique recognition, special amenities, and services that go beyond your expectations — that’s what you get when you book a My Time property. Look for the purple My Time icon next to the hotel’s name and your exclusive perks highlighted in the property description. These properties are the best of the best. •	Innovation – These featured brands constantly strive to improve the experience they provide for travelers. An Elevated Vacation Experience Enjoy exclusive perks and special amenities at no additional cost with My Time, available only at your travel agent with a GOGO Vacations package. Our My Time partners include some of the worldâ&#x20AC;&#x2122;s most spectacular hotels, and your special treatment includes expedited check-in and -out, room upgrades, spa, food & beverage or resort credit, early check-in or late check-out. Plus, each resort has something unique to offer its guests, such as free Wi-Fi, concierge services, and kids club access. Experience an enhanced vacation at over 100+ resorts with My Time, available through GOGO Vacations at your travel agent. 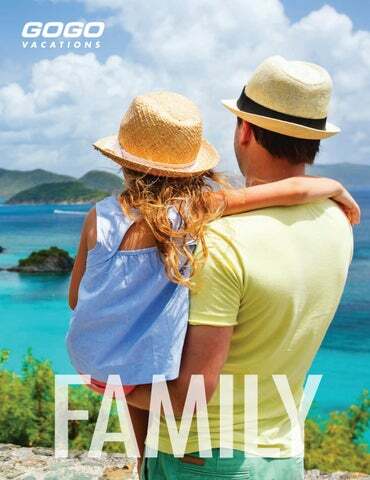 Take Your Pick for Paradise The opportunities for family fun in the Caribbean are endless. Aruba, Jamaica, The Bahamas, Turks & Caicos, and other luscious islands are bustling with lively hotels and resorts that can provide lasting memories for you and your family. There are games and entertainment for the kids, peace and relaxation for the parents, and sand and sunshine for all. Make the Most of Your Time Together With miles of powdery sand beaches, endless turquoise waters, swaying palm trees, and warm sunshine, the Caribbean provides a picturesque backdrop for your family fun. Kids clubs, teen zones, and infinite family pools guarantee the vacation of a lifetime for each member of your family. Come together for world-class cuisine, family recreation, and some uninterrupted relaxation on the beach. All for the Kids Your kids will be running to the on-site kids clubs every day. Some kids clubs tailor activities to learning about local nature and wildlife with activities like nature hikes, reptile hunts, and snorkeling tours. Others offer indoor options like state-of-the-art game rooms with Xbox® and Wii play stations, DJ equipment, and other games. At the end of the day, a tropical vacation is all about getting wet, and these resorts do not disappoint, with family designated pools featuring shipwrecks, water slides, and splash parks. Teen Spirit Delight your teens by bringing them to a resort where they feel like they have complete freedom on the expansive properties. They’ll be thanking you as they run off with their new pals to play beach volleyball, dive into water sports, climb a rock wall, race down water slides, or lounge on a beach cabana. Let them find their hip and trendy side at teen nightclubs where they can sip mocktails, flirt with a vacation sweetheart, take DJ lessons, and try their hand in DJ face-offs. Parents Get Their “Me Time” Book a romantic, revitalizing couples massage and take a soak in the spa’s invigorating tubs and Jacuzzis. Tee off at a world-class golf course or hit the pool’s swim-up bar for top-shelf spirits and cocktails. For dinner, resorts will arrange candlelit beachside picnics and nighttime horseback rides. Countless Activities Hike up the picturesque waterfall at Dunn’s River Falls in Jamaica. Explore living history in Old San Juan, where you can find old castles, forts, cathedrals, and shops lining the cobblestone streets. Engage your muscles and give paddle boarding or surfing a try in Aruba’s calm waters. See the exceptional colors of coral reef and tropical fish as you scuba dive deep beneath the waters off Curaçao. Join enriching and unique cultural experiences in alluring cities like Santo Domingo (oldest city of the Americas), Nassau, Old San Juan, and George Town, where you’ll discover cobblestone backstreets, picturesque cathedrals, bustling downtown plazas, intriguing colonial architecture, and UNESCO World Heritage Sites. There is no end to the kinds of fun you can enjoy on the Caribbean’s fantastic beaches, including swimming, sailing, windsurfing, Jet-Skiing, parasailing, fishing, diving, snorkeling, and kayaking. Cast for blue marlin, wahoo, dolphin, tuna and sailfish, and dive to meet stingrays and explore WWII shipwrecks. While you’ll find fabulous food in many of the resorts throughout the Caribbean, there is no substitute for dining on local cuisine at its source (and learning to cook it). The various cuisines of the islands – including seafood – are influenced mostly by African, Creole, Cajun, Amerindian, European (Portuguese, British, Spanish), Chinese, and other colonial cultures. There may be no better way to learn about people and what they do than to visit them in their own homes and businesses, and that’s exactly what you can do in the Caribbean. Learn to roll a cigar, watch artisans create original pottery masterpieces, and take a mixology class at a major rum distillery. The Caribbean Islands are still generally undeveloped, such that their natural attributes remain for all to enjoy. Explore Aruba’s desert-like interior on an ATV and marvel at the iconic divi-divi trees along the shores. Saint Lucia’s iconic, awe-inspiring Twin Pitons soar 2,400 feet up from the southwest shore, sheltering a lush interior rainforest. Family Fun Begins South of the Border With a plethora of vacation spots and a range of resorts and hotels, Mexico, Costa Rica, and Panama are the perfect destinations for your family vacation. Bond with your clan while discovering the jaw-dropping beaches, top-notch entertainment, and awe-inspiring archeological wonders that these tropical sites have to offer. Some of the most awesome resorts on the planet invite you to experience culinary abundance, top-shelf drinks, connecting rooms, kids-stay-and-eat-free promotions, and other fantastic extras at all-inclusive resorts. Get active with a wide array of land and water sports, indulge in gourmet à la carte dining, enjoy mid-day beach barbeques, spend the night dancing at the resort clubs, and see live shows and entertainment right on the resort property. A Host of Amenities & Extras Planning for this vacation couldn’t be easier. Most hotels provide everything you need for family fun and comfort, like five-in-a-room suites so you don’t have to book two rooms. Parents and kids will love special touches like colorful bunk beds, baby welcome packages including baby monitors, 24-hour baby-sitting services, and nightly turndown with milk and cookies. Some buffets feature special kids options, and swim-up bars serve mocktail daiquiris and piña coladas to excite vacationers of all ages. Diverse Diversions Enjoy outdoor movie nights, horseback riding on the beach, bike tours, theatrical shows, snorkeling, beach volleyball, and trivia nights. Savor gourmet buffets, beach BBQ grills, and à la carte meals with customized kids menus in a casual or fine dining atmosphere. Kids have fun splashing in water parks, shell collecting, face-painting, wall-climbing, and treasure hunting. Teens relish arcade gaming, beach volleyball, teen nightclubs, and DJ lessons. Which Destination Is Right for You? In Cancun, experience history, tradition, beauty, and nature at Xcaret eco-archaeological park, where you can witness cultural performances, explore underground rivers, and climb the tower for unbeatable views. There’s lots to do in Los Cabos: pilot a sleek WaveRunner® along the Baja coastlines, and saddle up for horseback riding through wild desert landscapes. Costa Rica’s famous Arenal Volcano is one of the 10 most active volcanoes on the planet, and Panama’s most famous attractions – the Panama Canal – still astounds with its immensity. In Cancun and many other Mexican and Costa Rican destinations, it’s practically de rigueur to ride horseback along the beach, in and out of the gently lapping waves. Jungle trails are also made for exciting ATV jaunts, and you can swing from treetop to treetop on a zip-line adventure just outside Puerto Vallarta. In Puerto Vallarta, a city tour sets you amid beautiful historical places such as the boardwalk and the main church. A tour of Cabo takes you to a blown-glass factory. In Costa Rica, a walking tour of San José covers historic residential areas, La Sabana Metropolitan Park, and the iconic 19thcentury National Theater. The inviting waters off Cancun/Riviera Maya, Puerto Vallarta, and Los Cabos are ideal for windsurfing, kayaking, and paddle boarding. Head to Isla Mujeres for great snorkeling adventures. You’ll find even more underwater life on a family snorkeling jaunt off Cozumel. You owe it to your family to take advantage of Mexico’s diverse culinary traditions. Enjoy a private guided walk on the cobblestone streets of Puerto Vallarta and discover an authentic gastronomy sampling where the locals really eat. In Costa Rica, explore the streets of San José, stopping at the Central Market, a hub for regional food. Among the many fascinating cultures of Mexico are the ancient ones, mainly the remains of Mayan civilization. Travel from Cancun to nearby Chichén Itzá to witness the sheer engineering splendor of the Pyramid of Kukulkán and the Great Ballcourt. In Coba, climb the Chimuch temple and wander along roads built over 1,200 years ago. Any number of local tours bring you right up to Los Cabos’ famed El Arco, perhaps Mexico’s most recognized natural wonder. Venture inland to the haunting beauty of Baja’s desert terrain in the Boca de Sierra, a UNESCO protected area. In Costa Rica, take in the most extraordinary views of the active Arenal volcano on a gentle hike along its base. A Wealth of Possibilities & Pursuits You don’t have to travel far for the family vacation you’ve always dreamed of. Full of iconic attractions, recreation, culture, cuisine, shopping, and history, the USA is an enriching experience. Whether it’s East Coast or West, LA or Orlando, Disney® or SeaWorld®, whatever and wherever your USA vacation, you’ll be struck by the sheer diversity of possibilities. Not Just for Kids There’s nothing more fulfilling than taking time out of the busy year to leave home and have a memorable vacation with your loved ones. With a large family, planning a trip that will excite the kids can seem like a daunting task. Fortunately, with a quick domestic flight you can arrive at a resort jam-packed with kid-friendly fun and luxurious adult amenities. All you have to do is pick your destination. Set in locations of great beauty and accessibility, resorts across the US are heavily invested in offering expansive sports and recreation facilities, including some of the best golf courses and tennis complexes found anywhere. After all that fun, soothe your muscles at some of the world’s most celebrated spas. From Sea to Shining Sea A trip to Florida offers all the benefits of an island vacation without actually leaving the USA. Swim in the warm and tranquil Gulf of Mexico, stroll miles of white-sand Atlantic beaches, and play golf on world-class courses. And California is an amazing place to bring the family, thanks to its diverse landscape, from hip, hilly San Francisco down the coast to Los Angeles, home of Hollywood. Home of Theme Parks Visit Disney’s® Magic Kingdom in Anaheim or Orlando for an enchanted family affair. Ride roller coasters, meet princesses and other characters, participate in games, see live shows, and rejoice in the love and happiness of your family during an adventurous visit to the land of the kids’ dreams. SeaWorld® has parks in Orlando, San Antonio, and San Diego, so unparalleled aquatic fun is accessible no matter where you are coming from. Indeed, sometimes it seems that all of America is a theme park: Join a nighttime tour of Washington DC to see the hallowed monuments and federal buildings in their dramatic lighting. Take a boat ride under the Golden Gate Bridge for an up-close view of this gorgeous landmark. Spend a day at Spectrum Field in Clearwater, Florida, and catch great baseball action during Philadelphia Phillies spring training and a season of minor league games. Awesome Beaches & So Much More Say “aloha” to lush vegetation, awesome beaches, alluring island music, relaxed vibes, and the warm and welcoming people in America’s very own paradise. Hawaii is a state – and a state of mind. You’ll feel it at the beaches, the luaus, the nightclubs, the hiking trails, the shopping areas, and the many luxurious resorts on the islands. Discover Hawaii’s breadth of activities, such as whale-watching, surfing, playing golf, hiking, and partaking in Polynesian-style festivals. When you’re looking to spend some quality time bonding with the family, Hawaii is where it can all happen. Oahu Hit famous Waikiki Beach, where vibrant blue waters and long, rolling surf breaks are ideal for surfing and swimming. Head to one of Roy “Iron Chef” Yamaguchi’s restaurants for the star chef’s bold Hawaiian Fusion cuisine. Then, luana (chill out) and soak up the cool Polynesian vibe. Maui Hit golden Ka’anapali Beach for body-boarding, kayaking, and sailing. At Lahaina, watch humpback whales during their winter migration. Hike to the summit of Haleakala, the world’s largest dormant volcano, for astonishing views. Kauai More beautiful than anything Hollywood could dream up, Kauai invites you to lose yourself in its quiet majesty. Follow Route 56 to the “end of the road” – Hanalei – lured by the sweet sounds of the ukulele. Big Island Watch the eruption of Kilauea in real time, and marvel at a lava flow that’s been creating new land continuously since 1983. Visit one of the Kona Coast’s 600 coffee farms, and snag a bag of prized gourmet coffee beans. Drive to the summit of Mauna Kea, the world’s tallest mountain to take in an unparalleled vista of stars. Molokai / Lanai With no discos, fast-food joints, or shopping malls, the good people of Molokai savor a simple way of life to be lived amid unspoiled beauty and awesome natural wonders. Virtually untouched by development, Lanai is an island ripe for discovery: Venture northwest on a rugged jeep road, and bump into an arid landscape strewn with boulders – the Garden of the Gods. Reservations and Payment A deposit and a signed itinerary confirmation are required at the time of booking. Upon payment of a deposit, You indicate acceptance of the General Conditions. The amount of the deposit will depend on the package booked. At GOGO’s sole discretion full payment may be required 45 days prior to departure; reservations made within 45 days of departure are subject to immediate payment in full; or such other time as GOGO notifies You from time to time. If You are part of a group and have a group representative, your group representative is responsible for advising the group of any/all cancellation penalties. Any person or entity, with whom You deal to book your Travel, does so strictly as your agent. GOGO disclaims liability for payments made to anyone (including such person or entity appointed as your agent), until we receive such payment earmarked for your account and we accept it as such. Cancellations and Refunds All refunds are subject to cancellation charges of up to 100% of the cost of the Travel. Detailed deposit and cancellation information will be furnished upon booking. All refunds are conditioned upon your understanding that your acceptance of a refund is on the express condition that You release GOGO from any and all liability and You thereby waive all additional rights and remedies under your contract or any applicable state, federal or foreign law. the express condition that You release GOGO from any and all liability and You thereby waive all additional rights and remedies under your contract or any applicable state, federal or foreign law. Car, Moped or Scooter Rental A valid driver’s license, major credit card and/or cash deposit are necessary for rentals. All countries have a minimum age requirement, please check with your travel agent for details. Supplements apply during certain periods. Local Taxes and Service Charges Local room tax, energy surcharges and service charges on room and meals are not included unless specified.Taxes and service charges are based on the hotel’s daily room tariff and not on the land package prices. Participating Carriers These packages are sold in conjunction with the services of approved ARC and IATA member carriers. Government regulations now enable air carriers to increase their fares on 24-hour notice. Airfare Air fuel surcharge is included in pricing. Some fares may be non-refundable but may be exchanged for a fee, plus any additional airfare costs due to difference in new airfares. Airlines offer varied promotional fares to the destinations included in this brochure. A minimum stay and advance purchase/ticketing is required. Holiday supplements are applicable and further restrictions may apply. Some airlines impose additional charges if you choose to check any baggage. Please contact your airline or refer to www.gogoworldwidevacations.com for more information regarding airlines checked baggage policies. Any changes or revisions to your Travel will be subject to charges at GOGO’s sole discretion or that imposed by a third party. Room photographs are shown for informational purposes only and may not represent the actual room category purchased. Maps represented in this brochure are shown for informational purposes only and display only approximate locations and attractions, and are not intended to be exact in every detail. Our price for Travel does not include porterage at airport (unless specified) and hotels; tips to local representatives, sightseeing guides, restaurant employees, hotel bellman and chambermaids, wines, liquors, laundry or any other items of a personal nature as well as any items not specifically mentioned within itinerary. Tipping is left to your discretion. In addition, price for Travel are subject to holiday blackouts, peak period and surcharges and other restrictions may apply and vary by resort, cruise and airline carrier. hotel, transfers and meal costs. Baggage is entirely at owner’s risk. You may see the name GOGO affixed to motor vehicles, on signs around the hotel or elsewhere. This use of our name is purely for reasons of identification and does not denote ownership, supervision, or control by GOGO in any way. The prices of these tours are based on rates in effect (including foreign exchange rates) at the time of printing and are subject to change without notice. Important Notes–Consult Agent PROOF OF CITIZENSHIP: Be prepared with proper documentation! United States citizens are required to have a valid passport to travel internationally. Visit http:www.travel.state.gov for information on how to obtain a passport, including forms, fees, and how to locate a passport acceptance facility nearest You. No refunds will be made if improper documentation results in denied boarding or entry. If You are not a U.S. citizen be certain to check with the consulate of the country You are traveling to for full entry requirements (Visas may be required in addition to passports). Requirements may change after this printing so we recommend that you verify any immigration requirements with the tourist office or consulate before you travel. CST #2088177 GOGO Worldwide Vacations is not a participant in the California Travel Consumer Restitution Fund. You are not eligible to file a claim against that fund in the event of GOGO Worldwide Vacations’ default. Your right to make a claim is on USTOA’s $1,000,000.00 Traveler’s Assistance Program. GOGO Worldwide Vacations, as an Active Member of USTOA, is required to post $1 Million with USTOA to be used to reimburse, in accordance with the terms and conditions of the USTOA Travelers Assistance Program, the advance payments of GOGO Worldwide Vacations customers in the unlikely event of GOGO Worldwide Vacations bankruptcy, insolvency or cessation of business. Further, you should understand that the $1 Million posted by GOGO Worldwide Vacations may be sufficient to provide only a partial recovery of the advance payments received by GOGO Worldwide Vacations. Complete details of the USTOA Travelers Assistance Program may be obtained by writing to USTOA at 275 Madison Avenue, Suite 2014, New York, New York 10016, or by e-mail to information@ustoa.com or by visiting their website at www.USTOA.com. Travel Protection Travel insurance can help cover unexpected events and is available to provide coverage that may include both medical and cancellation coverage for reasons listed on the description of coverage applicable to the travel protection plan purchased. Please refer to your consultant for more information. 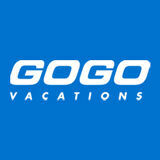 Since 1951, GOGO Vacations has led the way in providing quality vacations at the most affordable prices. Today we are the number one wholesaler in the United States. And for more than a million satisfied travelers a year, the name GOGO Vacations continues to assure financial stability, unequaled value and the widest selection of exciting vacations on six continents. Our nationwide sales agents are committed to helping your travel professional tailor-make the vacation experience of your dreams. As the first company to introduce independent customized package trips, we will help your travel professional plan your entire vacation and take care of every detail – from the lowest airfares and car rentals to an unparalleled selection of hotels and sightseeing options. Let us be your Complete Package Specialist. So, wherever you want to go – whether you want to relax by the turquoise waters of the Caribbean, ski the Rockies, explore the exciting cities of Europe, try your luck in Las Vegas or experience any of our other vacations – have your travel professional book you with GOGO Vacations and watch your vacation dreams come true!